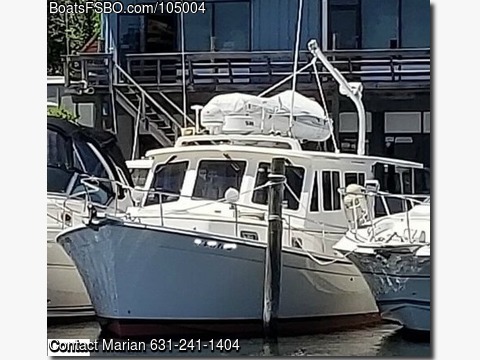 Please contact owner Marian- via Email: scrimshaw@optonline.net - Home Phone: 631-286-3891 or Mobile Phone: 631-241-1404. Boat Location: Patchogue Rd, Patchogue, New York. The Robinhood 33's sturdy, upright profile shows its workboat heritage. Notable is the ample wheelhouse, with its triple-pane windshield and large side windows. The side and bow railings, bulwarks and wide side decks are designed for safe passage around the boat. The cockpit is big enough for a day's fishing or an evening's entertaining, and there's a transom door to the swim platform for convenience. The boat rides a modified-vee, hard-chine hull designed for efficient planing and for stability in beam and following seas. The helm station has a side door to the deck. The cabin layout features a sofa with a high-low coffee/dining table and either a galley-down or galley-up arrangement, both with double sink, under-counter refrigerator, and three-burner stove. The head compartment has a vanity and a separate stall shower. The master cabin is forward, laid out with an ample V-berth and hanging lockers. The hardtop and crane were installed in 2008. It has rechargeable, ice block refrigeration so you can stay on the hook for a few days without using the generator. It is very fuel efficient. 6.5 kw diesel generator - 2 reverse cycle AC units - bow and stern thrusters - Bruce anchor with chain - anchor windless - Simrad chart plotter and 4G radar - Northstar chart plotter - 2 VHF radios - KVH satellite TV antenna with Direct receiver - cold plate refrigeration, 12 volt and 110 volt - microwave - 3 burner LP stove with oven and broiler -separate stall shower with teak seat - much more, please contact.